Celebrated Ghanaian entrepreneur and President and Chairman of Groupe Nduom (GN), a multinational conglomerate, Dr. Papa Kwesi Nduom, has won another international award in the United Kingdom (UK). The business magnate was early this year recognised and commended by the State of Georgia in the United States of America (USA) for his tremendous impact on his community through his spirit of service and desire to improve quality of life in the United States and West Africa. Dr. Nduom was among some distinguished Ghanaians who were on Saturday evening, June 3, 2017 recognised for their contributions to the development of the country and humanity by the Ghana UK Based Achievement (GUBA) in the UK. 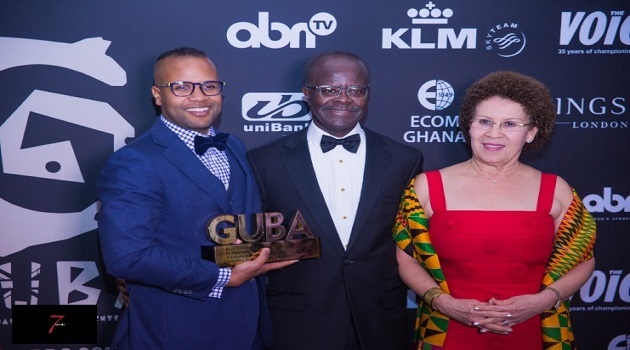 The renowned entrepreneur was the proud recipient of the Ultimate GUBA Black Star Award 2017 in the Excellence in Business Category. Dr. Nduom and wife, Mrs. Yvonne Nduom, jointly own Groupe Nduom, with over 60 companies, offering employment to many Ghanaians and others in Liberia, Togo, La Cote d’Ivoire (West Africa), the UK and USA. Groupe Nduom businesses include banking, investment banking, media, electronics, logistics, hospitality, insurance, private equity, pension, sports, academia, estate development among others. In the USA, Dr. Nduom owns ISF Bank based in Chicago, Illinois. Also in Liberia, GN Bank, a member of Groupe Nduom, has eight (8) branches. Dr. Ndoum was grateful to God for the honour done him. According to him, it was through faith that he has been able to get this far. He also thanked the Chief Executive Officer (CEO) of GUBA Awards, Dentaa Amoateng, for putting together such an excellent programme. Other awardees on the night included Mr. and Mrs. Mensah of Uncle John’s Bakery, Ace Investigative Journalist, Anas Aremeyaw Anas, Vice President, Unilever Francophone Africa, Maidie Elizabeth Akutu and Managing Director of FACS, Dr. Michael K. Obeng. The rest were Founder of Kristo Asafo Church, Apostle Dr. Kwadwo Safo, President of Group Ideal, Dr. Nii Kotei Dzani, Kelvin Doe, Dr. Jason Sarfo, Founder and CEO of Rigworld International Services, Dr. Kofi Amoa-Abban, CEO of Angel Herbal Products Industry Limited, Dr. Kwaku Oteng and CEO of Hills Oil Marketing. Dr. Nduom was accompanied by his wife, his son, Papa Wassa (Chiefy) Nduom, and some of his managers. They included Chief Executive of Gold Coast Financial Holding, Mr. Kwame Asomaning, Simpson, CEO, GN Life Assurance, Mr. Andrew Fiifi Simpson, and CEO, GN RE-Insurance, Mr. Joseph Kusi-Tieku. The rest were General Manager (GM), Groupe Corporate Affairs, Mr. Richmond Duke Keelson, GM, Accounting Financial Reporting (AFR), Patricia Agyekum and GM, GN Bank Diaspora Services, Mrs. Hilda Malm. GUBA Awards is a prestigious, annual awards ceremony inaugurated in October 2010. The event is held to showcase the talent and the achievement within the British Community, and the outstanding and valuable services provided to Ghanaians in the UK and Ghana.